African Black Soap, also known simply as Black Soap, is a type of body and hair cleanser. It is made from the ash of roasted plant materials such as plantain skins, cocoa pods and the leaves and bark of palm and shea trees. The ash is added to a combination of shea butter and other oils such as, but not limited to palm and coconut oils. African Black Soap is made from the ash of roasted plant materials such as plantain skins, cocoa pods and the leaves and bark of palm and shea trees. The type and quantity of oils used are determined by the area in which the soap is made. Traditionally, African Black Soap is made in West African countries, most notably Ghana. Each community has its own unique recipe and special methods for soapmaking. These differences in recipes and techniques result in subtle--and sometimes, not so subtle--variations in its appearance, texture and effects produced. If the soap is made in Africa, another common name is Raw Black Soap. This unrefined version is usually sold in bulk packaging, in contrast to the black soap that is manufactured in the US and Europe. Varieties of the latter generally contain artificial ingredients and are sold in the more traditional, Western soap box packaging. Who should use African Black Soap? Black Soap is beneficial for use on skin and hair. Consistent use as a part of an all-natural skin and hair care regimen will provide many benefits. Because Black Soap is so effective at controlling oil production, some individuals may find it to be overly drying for their particular skin type. When using it for the first time, it is best to start a once a day regimen to find out how your skin will react. Due to the subtle variations in the soaps produced from different regions and the inherent fluctuation in the properties of the natural ingredients used, it is common to find one batch of Black Soap a bit more or less drying than another. Due to its lack of artificial ingredients such as fragrance and dyes, African Black Soap works well for those people with sensitive skin, including babies and the elderly. Black Soap can also be used in natural hair care as a shampoo replacement. Simply place the soap at the scalp and rub against hair lightly. Black soap lathers very easily so one or two strokes will create plenty of lather. As an alternative to placing the soap on your scalp you may rub the soap between the palms of your hands and then transfer lather from your hands to your scalp. Once the soap has been applied, massage into scalp as you would your shampoo and complete your usual hair cleansing routine. 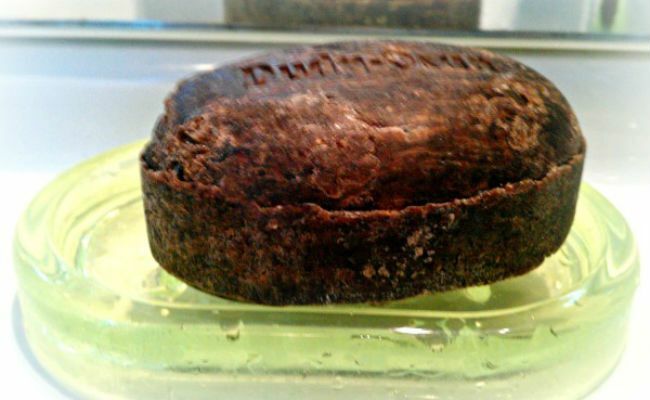 For some persons, black soap may be too stripping for regular washes. If you are one of those persons you may find it more appropriate to use black soap for clarifying. If you’d like the benefits of black soap in traditional liquid shampoo form, you can choose from any of the soap shampoos available on the market. Alikay Naturals and SheaMoisture are two popular natural hair brands that have shampoos based on African Black Soap. These brands are likely available in your beauty supply store. Raw (bulk) Black Soap can be purchased online at Amazon.com and a wide selection of black soap shampoos are also available.